From general purpose languages like Lise (short for (list (embedding)) to Domain-Specific Languages using the MOODs framework, and everything else in between. You can download the alpha version of the platform, here. We are going to cover MOGs, Gray, ASL and GrammarTraits in great detail inside the book. We will also build together line by line at least 6 languages, ranging from prototype-based and class-based OO languages and extensions, to Domain-specific, functional and multi-paradigm systems like Lise. Tiers begin at 5 euros per chapter for e-books in all formats including the interactive TOC-Boards that are developed within the platform. Total pledges in this tier will not surpass 30 euros in total since everything after the first 6 chapters will be free for all supporters. The printed/ebook combo comes in 10 euros per chapter, which I will distribute through blurb.com. Again here total pledges cannot surpass 60 euros, since everything after the first 6 chapters will be free. For all interested academic, research or other institutions the eBook will be distributed for free, as well as the inclusion to the Lands research network, with the possibility of an on-site lecture (if you can cover travel expenses). But !! 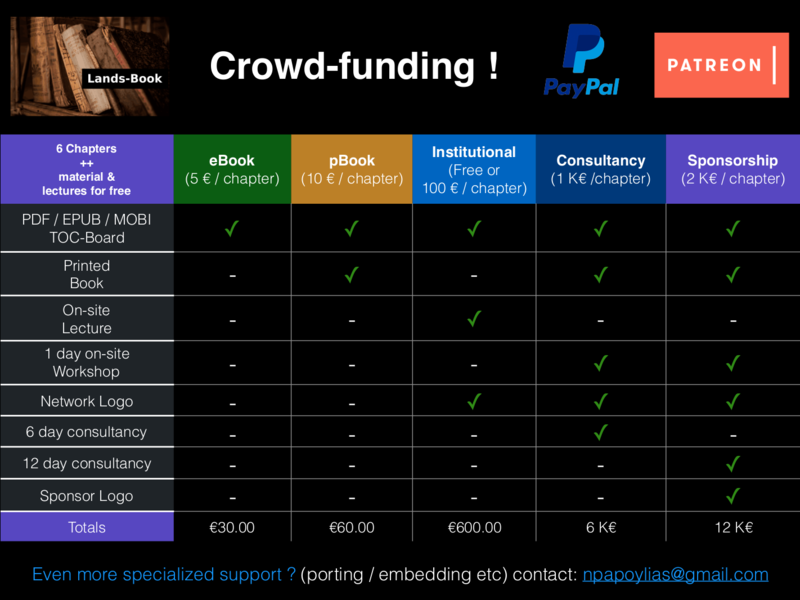 If you do have funding to support the project, consider joining at 100 euros / chapter (which will not surpass 600 euros of total support). Finally, if you and your company are making a living through parsing technologies (or you imagine doing so in the future) Lan.d.s will be an excellent R&D investement for you ! Your pledge can give you 6 to 12 days of consultancy (in total) for any parsing project you might have, an on-site 1-day workshop, plus networking and sponsoring logos on the Lands portal. For any additional crazy specialized support you might need (like porting / embedding re-licensing etc) contact me directly at: [email protected] and we may find a way to make it happen. I have been experimenting with different aspects of the programming cycle, with a primary focus on parsing, reflection, debugging, simulation and modeling. I am currently investigating the design and use of domain-specific and general purpose languages for interdisciplinary research. "Theory and Applications of Multi-Ordered Grammars"
Get all the book chapters as they become available in pdf/epub/mobi and toc-board form ! Pledges will be active only for the first 6 chapters (for a total of 30 euros). All additional book and lecture materials will be FREELY available to all patrons. The printed/ebook combo comes in 10 euros per chapter, and will be distributed through blurb.com. Again here total pledges will not surpass 60 euros, since everything after the first 6 chapters will be available for FREE to all patrons ! If you and your company are making a living through parsing technologies (or you imagine doing so in the future) Lan.d.s will be an excellent R&D investement for you ! Your pledge in the consulting tier will give you (apart from the book), 6 days of consulting (in total) for any parsing project you might have, an on-site 1-day workshop, plus a networking logo in the Lan.d.s portal. Are you as excited about the project, as I am ? Are you considering sponsoring ? Lan.d.s will be an excellent R&D investement ! Your pledge in the sponsoring tier will give you (apart from the book), 12 days of consulting (in total) for any parsing project you might have, an on-site 1-day workshop, plus both sponsoring and networking logos in the Lan.d.s portal.